I didn't know there still was a manual winding clock. Here it is on CFGUS. The clock was not working. It was so obvious that it was totally winding down. Wasn't it funny that I pasted $2 digital clock? It failed. So, I found the truth of it. Once wound, it started clicking. New cafe at Pender and Howe, downtown. BTW, Pender has a bike lane, both directions, sharing with buses. 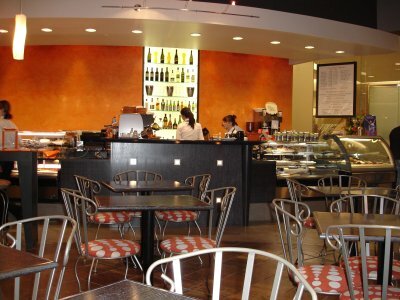 Behind the wall, there is an in-house bakery, so no doubt, worth tasting varieties of baked items.
. To be over 65 to take advantage of free BC Ferries.
. Only from Monday to Thursday, except statute holidays.
. Ride a bike from door to Tsawwassen Ferry Terminal ~ 40 km.
. Pack the bike to a bag, so that it becomes a carrying luggage.
. Another ride from Swaltz Bay Ferry Terminal to Victoria ~ 35 km. Then there you are downtown Victoria. You deserve tea at Empress Hotel, if only they allow cycling attired man inside. I'll be officially eligible this coming Monday, January 30. Pleased to have oil and filter changed. #1 Radio started acting up. Alt. Encoder on Transponder showing zero altitude! At least, AI and DC generator are working so far. Best of all, the engine is very easy to start and running happily. BTW, I've knocked off one of the magnito wire. I just touched and it's off. Half of my life depends on it. Half; as there are two independent systems. But both are so finicky, then redundancy is volunerable, isn't it? 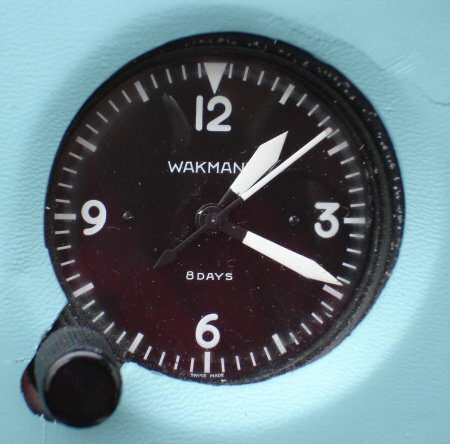 Surprisingly the 8 day manual winding original clock is clicking along these days!!! Rebuilt AI, reworked twice: It was ready at Precision Instrument in Delta. Defroster Duct: Aircraft orange pipe was picked up at Lindair and installed with AI. (External Power Plug was misordered. They got a receptacle, which is mounted on the aircraft. 3, 4 week wait again!! Voltage regulator: Installed. Again no charging initially!! Help!!!!! In all, three items were installed. Only thing left out today is oil and filter change. On our way to Harrison Hotsprings yesterday, we dropped in NJ, and quickly removed the broken defroster duct. I hope I can find the equivalent duct pipe easily. Voltage Regulator <-- Keep fingers crossed. Don't be serious; The conversion to Alternator is in this summer. The purchase date was December, 1989. 16 years! It served me well. It was with me on my IFR flights on Cessna 172, as a radio backup. And so many hours on Turbi, when the airplane didn't have its own radio. I rigged up this ICOM with my headset, with PTT tied to the control stick with elastic band. The current problem is VCO out of lock, whatever VCO is, the radio won't work. 2 years ago, it happened when the original battery pack failed, and then sitting ICOM shop for extended time cured itself by the sound of it. Yet, after checking the latest A6 (without VOR)'s price of $400 at a discount store, I quickly decided to spend $150 for resurrection. A6 is less than half the size of my A20 and also, very light, I imagine. But, heck! I like the old fashioned hefty look and volume of A20! Today was a very productive one. Both AI and Voltage Regulator were taken out of the plane, in the rainfall, sometimes heavy. AI is now at Berry's hand, and a new replacement regulator is in the bin at Lordco which I'll pick up tomorrow morning. Then I've realized the defrost duct has to be replaced. The existing one should be taken as a sample. It's an easy job to say the least. I just hope the parts will be easy to get. The malfunctioning digital clock was removed. There there was an original mechanical clock. I played with it, while the rain was too hard to work outside. A New Discovery! It's not electrically powered, instead winding type; classic. Once wound, the clock worked for a few minutes and stopped. I wiggled it, and it started again. Oil must be hardened with non-use for so long. I saw a note, saying 8 days. So, one winding will last more than a week, if it ever works! In another word, I should fly at least once a week to wind the clock. This is very practical, if the battery condition gets really sour. I've realized I need an adapter for aircraft use, particularly for GUS, which has a battery hidden in the back. Its external power plug costs $150. I guess, I have no choice. 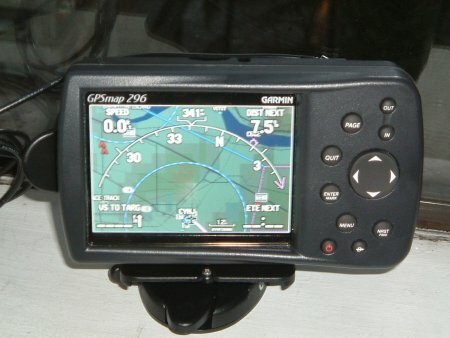 Garmin 296 GPS, Aviation Version with North American Moving Map Display. Sure way to find Langley Airport in all conditions. To be honest, I could not find it many times. Last time was just after snowfall in December. I was looking over south at Fort Langley. All the fields were covered with thin snow, and showed no difference. I must have requested vector to the airport from ATC.